I finally wrote a book!! After much research, driving, and writing Secret Cleveland: A Guide to the Weird, Wonderful & Obscure is published and available on Amazon and other favorite retailers. This book takes you to the unknown parts of Cleveland and shares fun finds as well as a few interesting historical facts. Between the pages, you’ll find new places to visit, plenty of photo ops and even some a few recommendations on where to eat. Even lifelong Clevelanders have been impressed by Secret Cleveland. Convinced we had nothing new to share we were able to surprise them with a number of secrets about the city they love. Secret Cleveland: A Guide to the Weird, Wonderful & Obscure takes you on a journey to explore hidden nooks and crannies in Cleveland, that you never knew existed, without leaving your home. 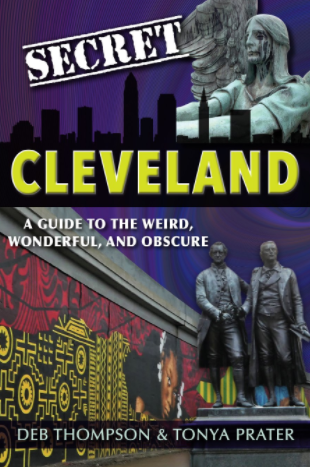 Haunted locales, world’s largest, odd sights, noteworthy inventions, unique foods and more exist between the pages of Secret Cleveland: A Guide to the Weird, Wonderful and Obscure. Discover where you can… find a cure for your cravings… see a weeping angel…visit Lake Erie whales…walk in the footsteps of giants…take a bridge to nowhere…explore roadside attractions…visit the crypt of an ex-president…learn about a misplaced historical marker. If you dare, take a leap down rabbit holes you never knew existed as you tour through 90 often overlooked gems in the greater Cleveland area. From bizarre, to funny, to surprising you’ll learn what makes Cleveland such a diverse and interesting destination to visit or call home. Never a boring moment, Secret Cleveland is a literary trip that will keep you wondering what you’ll discover on the next page as it walks you through attractions in Greater Cleveland, Bay Village, Lorain and Medina to name a few. TO BUY SECRET CLEVELAND ON AMAZON CLICK HERE! Be sure to follow Secret Cleveland Book on Facebook for regular updates on more secrets we find. FIND MORE FUN CLEVELAND ADVENTURES!!! Here’s a fun article about the Top 10 Things To Do In Cleveland for Families.